To celebrate the release of World War 2 drama Against The Sun starring Harry Potter’s Tom Felton today on DVD and On Demand, we’ve got 3 DVD copies to giveaway! The film is based on the book ‘The Raft’ which tells the incredible true story of World War II US Navy airmen who were forced to crash land their torpedo bomber in the South Pacific, and managed to sail more than a thousand miles to safety. 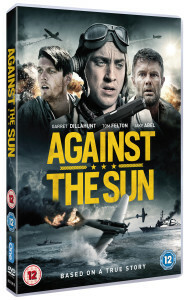 AGAINST THE SUN is a gripping war drama that tells the dramatic story of real-life castaways Harold Dixon, Tony Pastula and Gene Aldrich adrift on a forbidding ocean with few supplies and dwindling options for staying alive. The film also stars GARRET DILLAHUNT (12 Years A Slave, Looper, The Mindy Project) and JAKE ABEL (The Percy Jackson series, The Lovely Bones). The competition ends at 23:59 on 28 February 2016. The prize consists of an Against The Sun DVD.